The Urban Veg Patch: There's a wallaby in our playground! 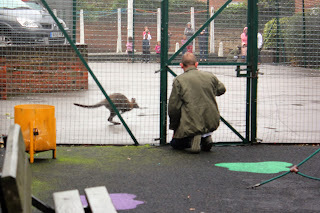 There's a wallaby in our playground! A bit of excitement and drama at York Rise this morning. When I opened the kitchen blinds this morning, I wondered why there were people standing around looking into our playground. As I watched, a wallaby bounded into view! Naturally, I grabbed my camera and rushed downstairs for a closer look. As far as I can gather, the story goes that it had somehow found its way onto the lower end of our flats very early in the morning, sat around quietly for a while in the gardens and then a group of tenants and workmen carefully herded it into our playground to save it from bolting into the nearby streets and traffic. Luckily the fencing had been replaced a couple of years ago so the area is like a huge secure cage - although at one point, the wallaby tried - and nearly succeeded - to get to freedom under the fence! 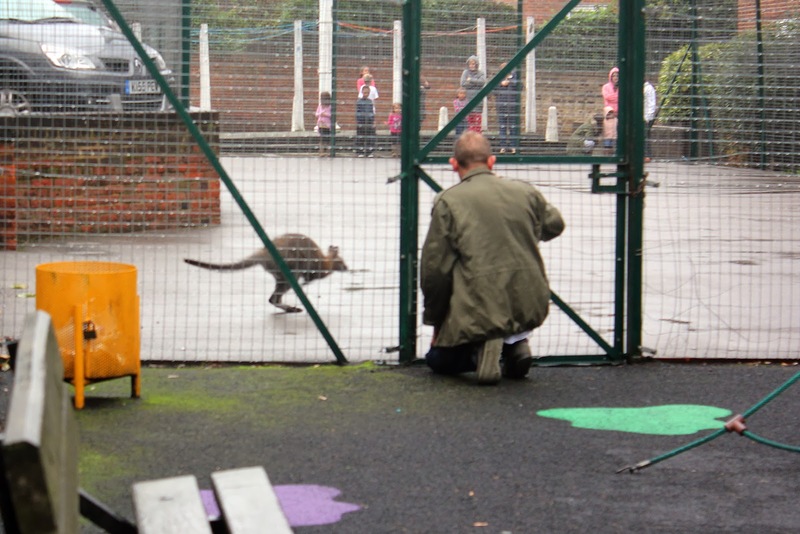 While we waited for the RSPCA to arrive, word quickly spread and families with children arrived to stare at this wonder - a wallaby in our playground!! Better than going to the zoo! The excitement! As the animal kept mostly to the perimeter fence, we were all able to get a really close up look, which felt like a rare privilege although the creature must have been quite alarmed! So what was it doing here? A recent story in our local paper reported a couple of wallabies having taken up residence in Highgate Cemetery, about 10 minutes stroll from where I live. No-one quite knows how they got there - or even if there's one or two wallabies - but the cemetery managers refused an offer from London Zoo to tranquillize the wallaby and take it away, saying that it was a good tourist attraction and they were keeping it in a secure place. Hmm, not that secure it would seem! The editor of our local paper, Dan Carrier, lives just around the corner so he also hotfooted it around to get the scoop for his paper - and, in the process, got involved in helping to keep the wallaby in the playground and then helped the RSPCA to unload him safely into the van. 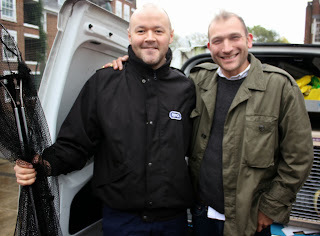 Ever the newspaperman, one of the children remarked that Dan was still taking photos with one hand while helping to get the wallaby into the RSPCA van with the other! His full story was up on the CNJ website within the hour with those photos. Great work, Dan! Here's the captured wallaby inside the RSPCA van. He'll be taken to an exotic animal centre near to Heathrow where his future will be decided. So much excitement and I still have the Fortnum and Mason Great Pumpkin Carving competition to attend today. I'll need a lie down after this! We thought it probably was the Highgate wallaby but, having seen videos of that animal, I think my wallaby seems less well built, probably younger. He was herded into the playground to keep him safe from traffic and, I think, travelled through the small hours to get here. Luckily very very quiet neighbourhood with little traffic! What an eventful day you had. Gosh yes! All normal chores and tasks thrown out of the window! Very rarely happens, but I love days like that when it does! Had to do a double take when I saw your photo Caro and briefly wondered what date is was :) How scary for the wallaby, how irresponsible of the cemetery manager but what excitement for you and your fellow York Rise residents. Hope that there is a happy ending for the wallaby. Have fun pumpkin carving which should be a relaxing end to an eventful day. Same as I did when I looked out of the kitchen window, Anna! I think this animal was relatively young so should settle well somewhere. I hope he goes to somewhere like Marwell or Whipsnade where there's plenty of freedom to roam about. I don't really agree with zoos and putting animals into small spaces, although it's a treat to see wild animals close up. Now that's something you don't see every day! Thank goodness the wallaby came to no harm. Absolutely! The RSPCA do marvellous work but the man admitted this was his first wallaby! I think he rather enjoyed himself and confessed that it was his birthday so a bit of a treat for him! How exciting but if there were two in the cemetery does this mean the other is now all alone? Nobody is very sure how many are in the cemetery, Sue. They think there are two because there were sightings at the same time but different locations ... however, people get things wrong. There's also been a sighting of just one on the Heath nearby so perhaps this is that animal. They're tough little creatures and I've now read they're adapting well to living wild in Britain! Apparently even some living in Yorkshire! The Fortnum and Mason Great Pumpkin Carving Competition sounds terribly grand. And well done for your filming scoop. We would have screamed with excitement if we'd seen a wallaby. A heron landed in our garden the other day, and we all yelled so loudly it flew off again immediately. We really need to practice our quiet birdwatching skills a bit more. You're too funny, CJ! A heron landed on a chimney near my mum's house a while back. My sister had the same reaction as you and he took off again which rather annoyed me as I was hoping for a good photo!! A lot of the kids here were trying to get close and feeding it lettuce and fruit so we had to keep them back a bit! Such excitement! Cute wallaby. I hope they can grow well and increase the population. We're already over-populated with very bold urban foxes, Endah and I've read that the foxes are predators of the wallaby so I'm not sure increased populations would be good for anyone! Nice thought though!! Good grief Caro, that's amazing! Congrats on your photos and video being used, what a blast. I hope they find the poor thing a good home. Haha! It was SO extraordinary that I think the kids will be remembering this for a long time. So exciting to have my photos and video used on the telly but - gosh - wish I'd thought to ask for payment! Probably would have paid for next year's seeds! How exciting, for you even if not for the poor wallaby. So glad it is now nice and safe and well done you for your photos and video being used! Thanks, Pauline. Wish someone could have told me how to get paid for my photo usage - I was too excited and just handed them over! Hindsight is a wonderful thing, isn't it! I'd dearly love to know what happened to the wallaby, I wonder if the RSPCA would be able to tell me. I think he's in safe hands now though. Yes, it was!! I was unaware that they'd been spotted living locally in the cemetery but it was novel enough for ITN to pick the story up for the evening news! ... which was equally exciting!